Here is an excellent letter from Mrs Maggie Mason reproduced with her kind permission. It would be really good if folk could write to Cumbria County Council before 13th March saying that they fully support Mrs Maggie Mason’s letter. Perhaps making some of your own points too. I note that the Environment Agency, the Coal Authority and the Royal Society for the Protection of Birds continue to maintain that insufficient evidence has been provided to approve this planning application and I hope that the officer’s report will recommend that the Development Control and Regulation Committee refuse the application. I consider that the disbenefits of the development outweigh the benefits, which makes the proposal fail to meet many of the policies above. This is the case whether we take into account just the onshore development (where CCC is the Planning Authority), or the total development including off shore fossil fuel extraction (where the Marine Management Organisation (MMO) is the decision maker). It is clearly wrong to include benefits of the offshore activity without the adverse impacts. Due to my recent bereavement I cannot fully develop the case I wish to make into formal reasons for refusal on each policy, but I request permission to speak at the planning committee on the 19th March. The following section explains the three core problems with this proposal as I see them, which cut across all the policies above. 1. This is a proposal for additional fossil fuel extraction at a time when the world faces a totally unprecedented environmental, human catastrophe if urgent action is not taken to leave fossil fuels in the ground. a. Although the development is for coking coal for use in the steel industry, a significant volume of high emissions “middlings” coal will be produced. There can be no watertight, enforceable way of guaranteeing it will only be used in processes which capture the worst emissions from that coal (as per the assurances the applicant has made). b. In any case, the use suggested, is itself a huge contribution to dangerous climate change. The “carbon” assessment assuming that this coal extraction would not be additional to the current US source of coking coal, but that the difference in miles travelled constitutes carbon reduction has been fully considered and minimised is oversimplified and unrealistic . It ignores the reduction in price due to additional supply which will enable more to be sold, and burnt. Hence I consider that a significant proportion of the carbon emissions arising from the coal to be extracted should be included in the carbon assessment. c. The applicant states that this coal will support the UK steel industry, whose future has now been secured. This is not the case, Port Talbot is supported only until 2022. The European Steel Industry is also under severe threat from China, and the UK. The likely outcome is either: that the demand for this coal will drop sharply, OR that it will be transported longer distances. 2. There are significant risks of subsidence offshore, where there are known to be layers of chemical and radioactive pollution on the sea bed. The application addresses this by extracting only a significant distance off shore, and pumping mining waste back into the voids which it is claimed will reduce the subsidence risk. a. Toxic substances disturbed by subsidence would move freely through the marine environment and there could be no way of preventing adverse impacts in protected areas, and to fish and other marine organisms. One impact which can bring the reality of the risk home to us, is that the percentage of multi-wintering salmon returning to Cumbrian rivers has reduced from 25% to 2-3%. All the rest die at sea. Our river salmon populations are plummeting, and have been described as an extinction event, and it is due to changes in the marine ecology and environment. b. No credible evidence seems to have been offered to the claim that pumping waste back into the mine will reduce subsidence. Pumping waste water back into shale gas wells has been shown to be the main cause of earthquakes in shale producing regions of the world. Inadequate seismicity testing is referred to in the Coal Authority response to the revised EIA, but note that they are only considering the onshore development. It must be even more concerning off shore. 3. It is tempting to think that this development will enable the detoxification and restoration of the Marchon site, that has been a problem for Whitehaven, and Copeland Borough Council for many years. It also appears to bring more jobs and prosperity to the town. However, this is very likely to bring more problems than benefits in the long term. a. There are jobs during the development phase, but the application emphasises a long term future, with well paid jobs. These are related to the offshore extraction, and should not be weighed in the balance unless the potential, and unknown impacts of the offshore extraction is known. b. An earlier application/proposal by the same backers but a different company name proposed initial coal extraction, followed by Underground Coal Gasification (UCG). This has never been done successfully in the UK, but is included in the Coal Authority Licence. The dangers of UCG, to both excess fugitive emissions, earthquakes and further subsidence would be controlled by the MMO, with no input from Cumbria County Council, as it could potentially be achieved with a minimal onshore planning permission. c. It is perhaps more likely that UCG would be refused by the MMO , in which case this mine will close, leaving us with fugitive methane gas emissions (as in the N Cumbria Coal Bed Methane applications) and a restoration problem somewhat like Keekle Head. The finance/ownership of this mine is from Australian and other international mining corporations. S106 agreements or deposited bonds would be very difficult to pursue, and even if funds are allocated, both Scottish and Cumbrian experience shows it is never enough to cover restoration. Last Friday 22nd February the Keep Cumbrian Coal in the Hole ‘Polar Bear’ highlighted the Beyond Crazy plan to mine for coal under the Irish Sea. A photographer from the Whitehaven News met us at the train station in the town to walk up to the Haig Pit. 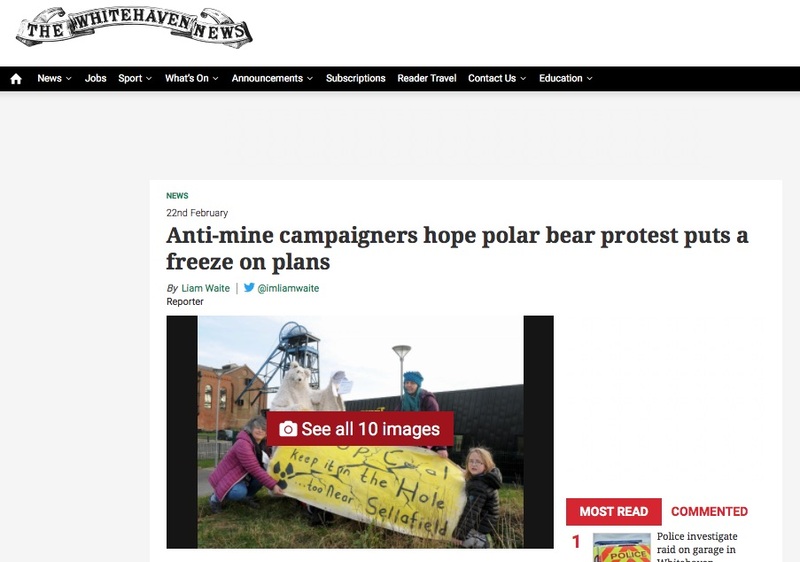 The Whitehaven News reported : “The ‘polar bear’ was actually Sam Morris who, along with Marianne Birkby of the Keep Cumbrian Coal in the Hole campaign, was protesting against West Cumbria Mining’s plans to extract coking coal off the coast of St Bees. “The pair tore up a copy of the Paris Agreement – a global agreement to tackle climate change – outside the developer’s Whitehaven office. Really? The fact that this must be the most deferred planning application to go before Cumbria County Council ever, rather belies this statement. The reason for the delays are that the Council, and the regulators are not happy with the content of WCM’s application and require further clarification and answers from the developers. What can be clarified is that this development is Beyond Crazy while the rest of the world looks Beyond Coal. A recent document handed to Keep Cumbrian Coal in the Hole (below) gives some insight into the climate impacts and the deaths that would result from opening up this deep coal mine. Meanwhile, the impacts on Sellafield are of course unquantifiable – an increase in seismicity in the area housing such a vast stockpile of the world’s most dangerous radioactive wastes is unthinkable. The consultation period ends on January 28th, Cumbria County Council will still accept letters after this time but the sooner you write the better. Send your email now to Cumbria County Council at developmentcontrol@cumbria.gov.uk. Please also ask if you can speak at the meeting on the 22nd February – the more folk who write, speak and make a noise against this plan the better chance we have of stopping it. This coal mine proposal flies in the face of Cumbria County Council’s Carbon Reduction Plan and Climate Local programme. The mine workings would extend to within 8km of Sellafield, this would increase the risk of earth tremors and worse. Collapse of the sea bed as a consequence of mining under the Irish Sea would resuspend radioactive particles from decades of Sellafield reprocessing. Here below is an excellent letter from Sam who is a member of Radiation Free Lakeland. Feel free to use this as inspiration to write your own letter of objection. It doesn’t need to be long – just a sentence or a paragraph or two. In response to the current consultation I wish to make the following comments regarding the revised Environmental Statement from West Cumbria Mining [WCM]. This letter is additional to my submission of Feb 6th 2018. I am writing to raise serious concerns concerning climate change, subsidence, earth tremors and the potential to trigger a major nuclear emergency at Sellafield. I wish to OBJECT to the application. I wish to raise four major grounds on which this application must be firmly rejected. The revised Environmental Statement fails completely to address the UK Government’s commitments to carbon reduction within the 2008 Climate Change Act and the increasingly stringent restrictions regarding the extraction and burning of fossil fuels. WCM continue to refer to ‘metallurgical’ coal as if this is in no way related to the coal used in energy generation. The simple facts of physics are that all coal produces CO2 when burned for whatever purpose. WCM seem to be completely unaware of the global urgency of reducing carbon emissions. The proposal to open a new coal mine in our current precarious climate change situation is completely counter to Government policy. Subsidence, earth tremors and nuclear accident/emergency. This ONR map shows the offsite emergency planning zone around Sellafield. This shows the area where planning consultation with ONR is required. The ONR state that Woodhouse Colliery would be approx. 10 km from Sellafield. WCM state the mine would reach within 8km of Sellafield. Which is correct? Surely it is essential to know exactly what the distance may be. Even more crucially – this is not a mere surface development – the WCM application concerns undersea mining in an area known to be heavily faulted. The nature of underground earth tremors and minor quakes is that they travel in unpredictable ways through the rock. Earth tremors have no regard for the 7.4 km exclusion zone drawn on the map. The geology that WCM plans to mine is completely connected to the geology underneath Sellafield. That the mine would be outside the formal ONR planning zone by up to 4km is completely irrelevant given the unpredictable nature of earth movements. Any earth tremor caused by mining or subsidence would have catastrophic effects in terms of a nuclear emergency bringing massive danger to life over a vast area. Potential collapse of the mine. This is a very worrying response. Firstly ONR states that they believe that the mine is not designed to collapse – then they state that if it did so it would not affect nuclear safety. ‘Pillar and Room’ mines can and do collapse. Summary and Conclusions On August 6, 2007, six miners were killed in a catastrophic coal outburst when roof-supporting pillars failed and violently ejected coal over a half-mile area. Ten days later, two mine employees and an MSHA inspector perished in a coal outburst during rescue efforts. In the event of a mine collapse at Woodhouse the potential for injury and death would reach well beyond the mine shaft itself. Radioactive accidents at Sellafield could affect much of the UK and neighbouring nations. How can this application possibly be agreed given that WCM and the ONR are clearly not operating on the same basis regarding the basic mining method and associated risks? It is telling that WCM themselves are acknowledging the very real risks of the Cumbrian coal fields and are seeking to ‘mitigate’ them. This is a glaring inconsistency and indicative of the wrong footed nature of this entire application. What Nuclear Emergency Plans are in place by the County Council should tremors damage the containment vessels at Sellafield? There are big lessons to be learned from the fracking industry at home and abroad. Groningen in the Netherlands is Europe’s biggest gas field. The Netherlands Government has recently decided to close it down leaving billions of euros of gas in the ground. So far 80,000 homes have been damaged, families are living in sheds and schools are closed. The truly frightening aspect of this is that ALL of the Groningen quakes measured less than 4. The Netherlands Government had insisted that they were harmless, yet the damage stands at 8 billion euros so far and the closure of the industry. Groningen had few geological faults or earth tremors before the extraction began. West Cumbria has a history of both faults and of tremors. The nature of subsidence and earth tremors is by nature unpredictable. What is certain is that this constitutes a very real potential. The damage caused in the Netherlands by allegedly ‘safe’ levels of tremor would result in radioactive mayhem were such tremors to occur in West Cumbria where we have Europe’s largest collection of deadly nuclear waste. This potential risk of a nuclear accident/emergency is simply too great a risk. There is no way that Cumbria County Council can possibly assure the public safety of this proposed mine and the application must be firmly rejected.